Proper evaluation: Ask the employee to think about and evaluate his or her own performance prior to the review session. Examine Information: Prepare for the review by examining information available about the employee’s performance. Seek additional information if needed. Positive beginning: Begin the session on a positive tone to set the employee at ease and make him or her receptive to the performance review process. Explain the format: Explain the format of the performance review session. 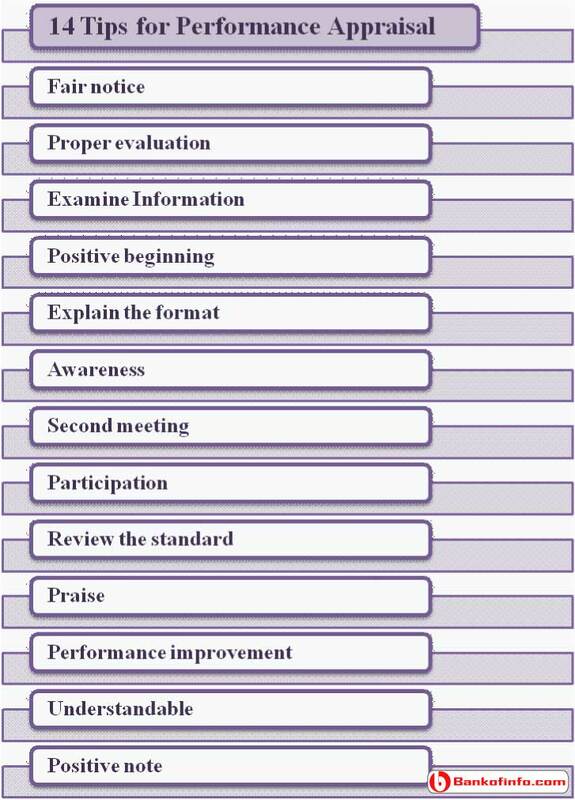 Awareness: Make the employee aware of the uses of the performance appraisal results (e.g. training and development, salary decisions, promotion decisions). Second meeting: If needed, set a second meeting to discuss non-performance related issues such as the salary increase, future goals, or developmental suggestion. Participation: Encourage the employee to participate, especially when he or her appraisal differs from yours. Review the standard: Review the standard to which the employee wee be compared to remind him or her that the process is not complete! subjective. Praise: An organization should ensure the praise to an employee for his achievement and take necessary steps. Highlight weak areas: you should highlight weak areas first and then you can take attempt to resolve it. Performance improvement: Find out the weak area of an employee and discuss the ways of improving performance. And it will increase the confidence of an employee. Understandable: Make sure that the employee fully understands appraisal. Positive note: End the discussion on a positive note. Even in case the negative result of performance appraisal. Followed, the manager becomes a counselor instead of an evaluator. This type review session appears to be more useful and enjoyable for both the evaluator the employee.